This protocol describes the detailed experimental procedure for stem-loop RT-PCR using SYBR Green I. The procedure begins with reverse transcription of total RNA, or small RNA-enriched RNA, miRNA, siRNA, etc. The cDNA is then used as template for real-time PCR with gene specific primers. You may need to modify this protocol if you use different reagents or instruments for real-time PCR. The stem-loop RT-PCR method described here is designed to detect and quantify sncRNAs, especially for miRNAs in a fast, specific, accurate and reliable manner. First, a specific stem-loop RT primer is hybridized to the sncRNAs and then reverse transcribed. Next, the RT product is amplified and monitored in real time using a specific forward primer and the universal reverse primer (Fig 1). This method enables sncRNAs expression profiling from as little as 10 pg of total RNA and is suitable for high-throughput sncRNAs expression analysis (Chen et al., 2005; Varkonyi-Gasic et al., 2007; Cheng et al., 2009; Varkonyi-Gasic et al., 2010; Chen et al., 2011; Hurley et al., 2012; Jung et al., 2013; Salone et al., 2015). Fig 1. Scheme for stem-loop RT-PCR. 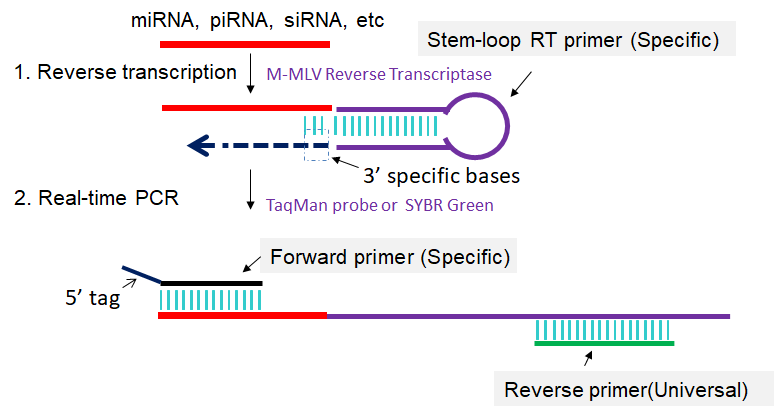 1: Reverse transcription of sncRNA primed by specific stem-loop RT primer. 2: First-strand cDNAs are amplified in PCR by using specific forward primer and reverse primer complementary to stem-loop RT primer. Reverse Transcription is carried out with the M-MLV Reverse Transcriptase (RNase H-) for RT-PCR. The following procedure is based on manufacturer’s protocol. 5. Incubate the tubes in a PCR machine using the following cycling conditions: 16 ℃ for 15 min, 37 ℃ for 20 min, 42 ℃ for 20 min, heat inactivate at 95 ℃ for 5 min, and then chill on ice. 2. Varkonyi-Gasic E, Wu R, Wood M, Walton EF, Hellens RP. Protocol: a highly sensitive RT-PCR method for detection and quantification of microRNAs. Plant Methods. 2007, 12;3:12. 3. Cheng A, Li M, Liang Y, Wang Y, Wong L, Chen C, Vlassov AV, Magdaleno S. Stem-loop RT-PCR quantification of siRNAs in vitro and in vivo. Oligonucleotides. 2009, 19(2):203-8. doi: 10.1089/oli.2008.0176. 4. Varkonyi-Gasic E, Hellens RP. qRT-PCR of Small RNAs. Methods Mol Biol. 2010, 631:109-22. doi: 10.1007/978-1-60761-646-7_10. 5. Chen C, Tan R, Wong L, Fekete R, Halsey J. Quantitation of microRNAs by real-time RT-qPCR. Methods Mol Biol. 2011, 687:113-34. doi: 10.1007/978-1-60761-944-4_8. (The experimental principles and procedure of stem-loop reverse transcription (RT)-based TaqMan(®) MicroRNA assays and poly(A) tailing-based and direct RT-based SYBR miRNA assays were introduced in detail.). 6. Hurley J, Roberts D, Bond A, Keys D, Chen C. Stem-loop RT-qPCR for microRNA expression profiling. Methods Mol Biol. 2012, 822:33-52. doi: 10.1007/978-1-61779-427-8_3. 7. Jung U, Jiang X, Kaufmann SH, Patzel V. A universal TaqMan-based RT-PCR protocol for cost-efficient detection of small noncoding RNA. RNA. 2013, 19(12):1864-73. doi: 8.1261/rna.040501.113. (This article describes a universal TaqMan-based probe protocol which can be used to detect any target sequence and demonstrate its applicability for the detection of endogenous as well as artificial eukaryotic and bacterial small RNAs.). 8. Salone V, Rederstorff M. Stem-loop RT-PCR based quantification of small non-coding RNAs. Methods Mol Biol. 2015, 1296:103-8. doi: 10.1007/978-1-4939-2547-6_10.